The Glass Castle, an extravagant memoir by Jeannette Walls, is about her life as she went through an adventure when living in poverty. When she was younger, her family moved several times while trying to run away from the bill collectors. Walls’s mother refused to work due to mental health issues and her father was never home, so Jeannette and her three siblings had a very tough life. 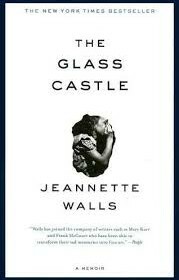 Her father’s biggest dream was to create a glass castle that they would all live in and Jeannette promised she would help him. When Jeannette and her sister finally thought of a plan to get away from their rotted house and challenged family, they ended up in New York City with many job opportunities. The Glass Castle is a fantastic novel that hooked me in the first chapter. This book starts off with stories from her younger life that show how she was treated like an adult, which I think was a great way to start off the book. She was able to describe her life in a way that would tell you how she struggled, but at the same time she was able to fix her problems in her own way. For example, when her piggy bank had been broken open and all the money was gone she found a way to raise the money back. Jeannette was able to show how her life was difficult and not the same as a typical person’s life. The kind of places she lived in and how intelligent she was because of having to fend for herself most of her childhood. I recommend this memoir to anyone that wants to see life through the eyes of someone who gave meaning to their difficult life.